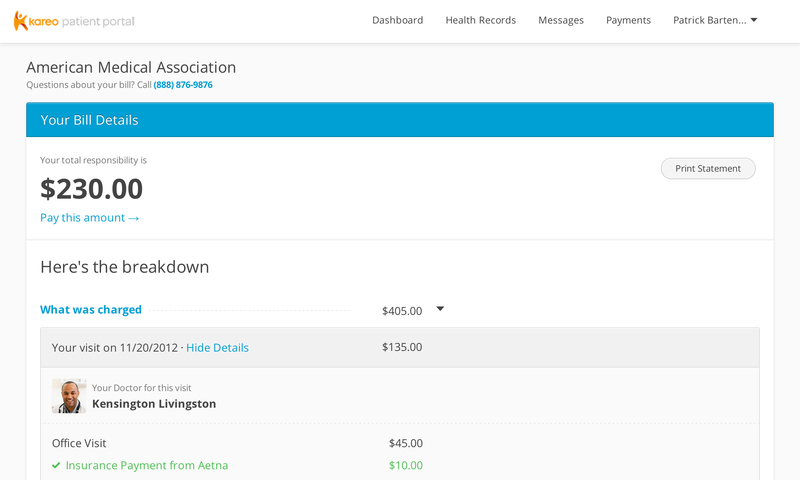 Easily understand and pay your medical bills, message your doctor, and see your medical records. Communicating with healthcare providers and understanding your health is a serious problem in the United States. Medical records, payment systems, messaging are typically run on outdated technology. Kareo Patient Portal aims to help reduce frustation in three areas: payments, health records, and patient-provider communication. Insurance payments come after claims have been received. But patients don't know what they will be charged and what their insurance will cover. This is called an EOB—an Explanation of Benefits. It looks like a bill but it isn't. You get that later. When you owe money not covered by your insurance, you'll receive a bill from the provider. If the provider is a small medical office (1-5 doctors), the bill will be a cryptic, indecypherable mess. Once you figure out what you owe to your doctor, many times you are required to pay by check or over the phone. A barrier that prevents people from paying on time. Simply getting access to your healthcare records can be a nightmare. We wanted to design an accessible and simple way to see your current and past medical histories using baselines set by the federal government. One problem I wish we worked on was interoperability. Healthcare records are locked in databases owned by insurance and healthcare providers. This data is a valuable commodity for the organization (it increases switching costs for the patient and thus creates a defensive mote around the company) and they are not keen to share it. However, by locking data in these silos, it prevents accurate information from reaching doctors at the right time and leads to poor health outcomes for patients. The Patient Protection and Affordable Care Act (aka Obamacare) included incentives for healthcare providers to allow patients to securely message their doctors. As a doctor, if you gave your patients a website where they could email or otherwise message you, the federal government would send you a check for several thousand dollars. We learned from interviews with patients and healthcare professionals that many patients don't care about statement details; they just want to know what they owe and how to pay it. This was difficult for us to believe. How could patients not care about what they're paying for? We listened to the feedback and designed a payment solution that payment solution (using Stripe) that connected to the Patient Portal. But we also let patients make payments without logging in, authenticating, and viewing their statements. All they could see if what they owed and to whom. More on this later. 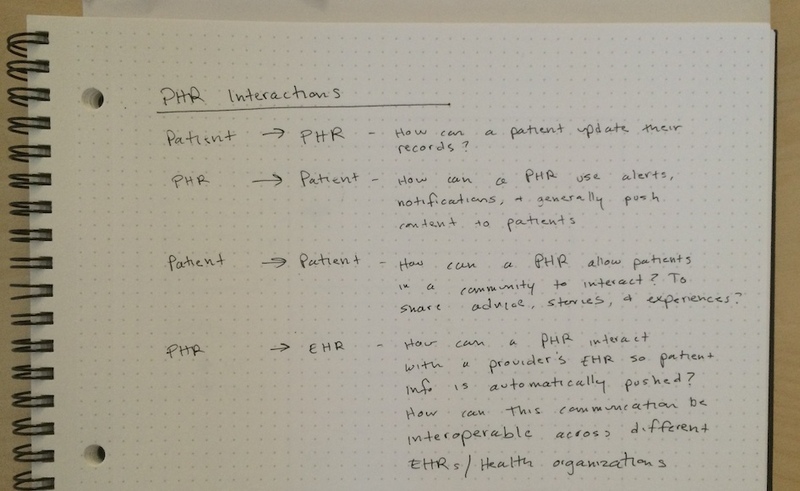 Some early thinking about patient portals. I usually start by asking questions about needs, behaviors, and relationships. 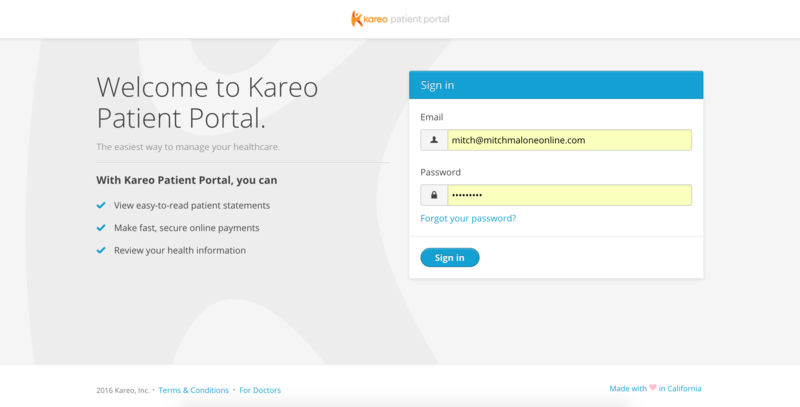 Kareo Patient Portal's feature set is determined by the type of Kareo customer. Certain functionality won't work if the customer doesn't have certain products enabled. For example, patient's can't make payments if the practice doesn't have Kareo Practice Management. We want to change this so practices can collect the money and work with an in-house biller or outsourced biller to adjudicate the amount. The value in signing up for the full Kareo suite is a lot of that work is done automatically. Below you can see the basic structure of how patients can interact with their practices with three typical scenarios. 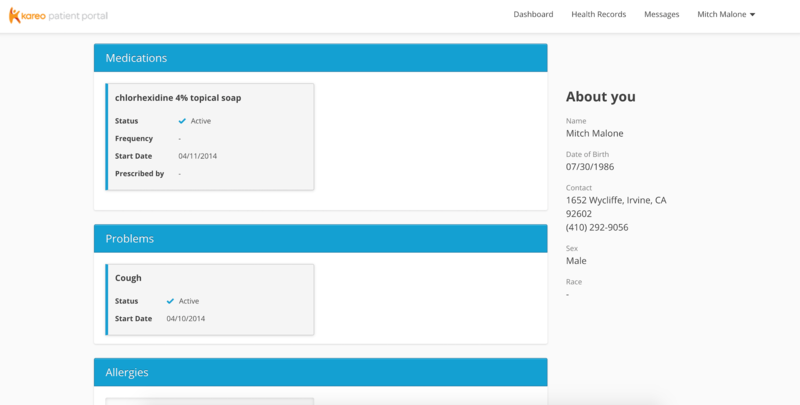 Basic functionality for how patient portal connects to doctors, billers, front desk staff, and patients. Since we learned that patient's mostly just want to make a payment, we made the payment process very simple. We designed the Patient Portal so a person can make a payment without logging in. Without authentication, patients can't view medical records or secure messages. But that's ok—the task is just to make a payment. 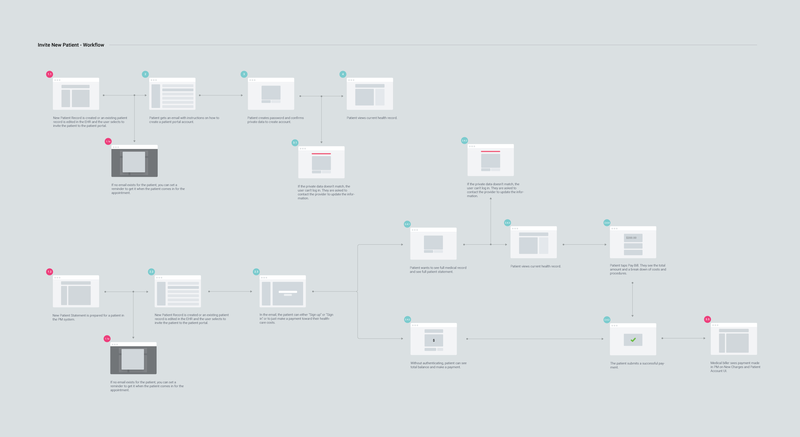 Workflow for how a patient initially signs up for the Patient Portal. Notice how you can make a payment without actually logging in. The complete medical record was designed for clarity. 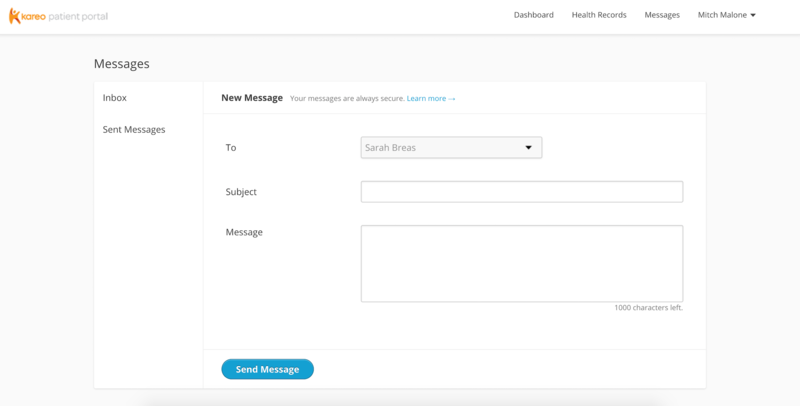 With Kareo Patient Portal, it's easy to send a secure message to your provider. The part of this project that I am most proud of is the redesigned patient statement. If you're like me, you never understand the statements that you get in the mail from your healthcare provider. There is a form called an "EOB"—an Explanation of Benefits. Many people we interviewed believed this to be the bill they owe, despite many having a large "NOT A BILL" disclaimer. But for all intents and purposes, it's a bill. So we set out to make a simpler, more understandable bill. The new patient statement focused on clarity. We assumed that if the statement was clear, people would be more likely to make payments. The new bill is a simple itemized list that shows exactly what happened at each visit, how much insurance paid, and much was written off, and what's left over.